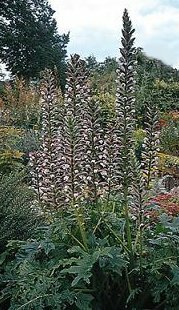 Acanthus is a hardy perennial herbaceous plant native to Europe, valued for centuries. The deeply lobed leaves are said to have been the inspiration for the decorations on ancient Greek Corinthian columns. They belong to the family Acanthaceae. The leaves, which are arranged at the base of the plant, surround spikes of soft pink blooms produced in the spring. They are happiest in a sunny or lightly shaded location in well drained ordinary soils. Heavy clay soils are discouraged. The plants grow very slowly and dislike being disturbed once established. Propagation is best done by sowing seed, though the plants can be increased by digging and dividing in early spring. Seeds are sown in pots, trays or prepared beds, kept moist, but not soggy, and maintained at 65-70F. Once the seedlings reach about 2" in height, they may be transplanted to larger pots or into the garden, if the outdoor temperatures do not fall below 65F.